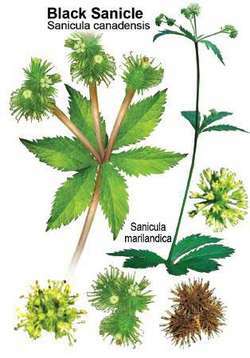 white-green flowers with bur-like fruit with 2 seeds. Rhamnus cathartica * Rosa Carolina Rosa multiflora * Rosa setigera Rudbeckia subtomentosa Salix exigua Sanicula canadensis Sdrpus atrovirens Sdrpus pendu lus Sdrpus sp. B, C, E, Ha, P N 4224 Gray [Leavenworth's eryngo] Sanicula canadensis L.
muhly grasses; Sanicula canadensis, Canada sanicle; and Viola sororia, sister violet.